The Carolinas are quite the talent-rich region when it comes to college baseball. Check the top five of any poll, and you will see the names of South Carolina, North Carolina, and Clemson. Look down further, and you'll see North Carolina State ranked in the top 25 as well. But there are several more smaller schools outside of the 'major' conferences that deserve their due. East Carolina consistently plays one of the tougher schedules around and has been a quality program in the CAA and Conference USA for several years, and went to the Super Regionals in 2001. College of Charleston has averaged 47 wins a year in the past three seasons, and advanced to the Super Regionals last year. Coastal Carolina won 40+ games each year from 2001 to 2005, and was a #1 seed in '05. UNC-Wilmington has won 40+ games in each of the past four seasons, and gone to three regionals in that span. But you certainly can't have a conversation about good Carolina baseball without mentioning Winthrop. The Eagles won 44 games in 2005 and 46 last season, and have made five regional appearances in the last eleven seasons. Last year they finished runner-up in the Chapel Hill Regional to eventual national runner-up North Carolina. Winthrop spent a lot of time in top 25 during last year's 46-18 season, moving up as high as 16th. Coach Joe Hudak's club challenged (and beat) some of the best in the country, picking up road series wins at Miami and Alabama to start the season, road wins at Clemson and UNC, and also victories over Wake Forest and regional participants Evansville and Michigan. This year, the Eagles are once again a favorite in the Big South and opened the season ranked in the top 25 before recently falling out. As of Wednesday, following a 6-4 loss at Clemson, Winthrop stands at 8-6, with three of those five losses coming by one run. Winthrop's roster is decorated with a broad range of players from many areas (16 different states are represented , and second baseman/outfielder Phil Carey hails from London, Ontario), and there are also a number of impact transfers on the club as well. One of those transfers is outfielder/DH Billy Froehlich, formerly of Winthrop's former conference rival Birmingham-Southern. Froehlich was named the Big South's Freshman of the Year in 2005 after hitting .331, and followed that up by hitting .287 with 35 RBI as the Panthers won the Big South regular season title by a game over the Eagles. But shortly after the Panthers' 2006 season ended, Birmingham Souther's administration decided to move the school's sports programs from D-I to D-III. That move eliminated one of D-I's up-and-coming programs (BSC compiled a 57-15 record in its three years of Big South membership, won regular season titles in '04 and '06, and made the regionals in 2004), but more importantly, it left many looking for a new home, including Froehlich. The versatile player had his share of options, including a couple of schools in his native Ohio, and other options in the South, but ultimately, his first-hand knowledge of the quality of Winthrop's program helped him make the choice to go from Birmingham to Rock Hill, South Carolina. Being uprooted like that had a great effect on Billy, but familiarity can make many things a lot easier. Not only was his familiarity with the program and team helpful, but so was playing with one of his future teammates in the summer. The other player also happened to be a transfer, pitcher Owen Reid from Baylor, who he played with on the Wisconsin Woodchucks of the Northwoods League. Froehlich admits that putting on a new uniform did take a little getting used to, but he's settled into it now. He's started twelve of the thirteen games he's played in, either as the left fielder or DH, and hit his first homer as an Eagle against Xavier in an 8-2 win on the 17th. Last year's left fielder Jacob Dempsey, who was a four-year starter and was an All-American after a stellar senior season, is now in the professional ranks, so it was a win-win situation for both player and team. Winthrop may not be a big-time school, but it has produced some big-time talent in the past few seasons, from big hitters like Dempsey and former All-American Daniel Carte, to two-way star Heath Rollins, and pitcher Alex Wilson, who was one of the nation's top pitchers as a freshman last season. Senior infielder Chris Carrara and senior outfielder Tommy Lentz were two of Winthrop's six first-team all-conference picks last season, and Rollins, Wilson, and Dempsey all received All-America honors. 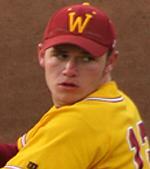 Wilson received conference and national freshman of the year honors as well, after his 13-3, 143 strikeout season. Froehlich went 3 for 7 with two doubles and a homer against Wilson last season, and admits that he preferred those head to head, in-game matchups against him as opposed to facing him as a teammate. The Eagles have also proved that they can hang with the big boys, and don't shy away from playing them. They opened the season with a series at UCLA, and also have already played at Georgia and Clemson, and still have games on tap against Mississippi State, Baylor, Texas, Wake Forest, and North Carolina. That aggressive scheduling could be likened to a 'mid-major' in basketball such as Gonzaga, whose continued success on a national level helped them shed that label. But, mid-major isn't a term that applies to schools like Winthrop in baseball. In basketball or football, the gap between the top teams in the power conferences and those in the smaller conferences is a great deal wider, but in baseball, that's not so much the case, where 'lesser' conferences like the Missouri Valley, Sun Belt, and Big West perennially field several quality teams. Playing at a smaller school has its advantages. Froehlich feels that because of the smaller, closer-knit atmosphere, the team is more like a family and fraternity than just a group of individuals. It also helps that Winthrop has deep Christian roots, which is something that is very important to Froehlich. The same was the case at Birmingham Southern, where he feels that he did a lot of growing and became much more mature in his two years there. That has continued at Winthrop, where the coach and his teaching style is an extension of the school's background. That helps foster success both on and off of the field, and for Froehlich personally, his faith helped him get through a situation that would have brought down many. In a day and age where you hear far too much about negativity, it's refreshing to see the success of a program like Winthrop. Coach Hudak has built his program the right way, and brought in players who are not only talented but have the right character, who become not only better ballplayers but better people. And there's no doubt that if the program continues to be run the same way, Winthrop will have many winners on the field, but more importantly, off of it as well.